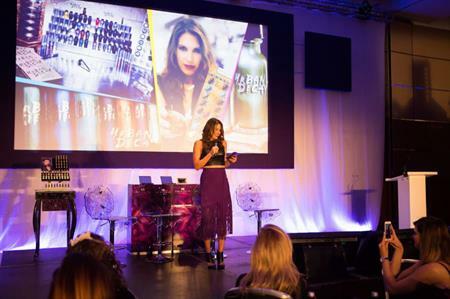 Urban Decay held its 2016 conference at Sofitel London Heathrow for 487 delegates. On 1 June, Sofitel London Heathrow T5 hosted the Urban Decay Conference 2016, attended by L’Oreal staff members and Urban Decay beauty advisors. The annual event needed to include a daytime conference, for strategy planning, product launches and guest speakers. The event also had to include an awards ceremony, with an evening reception and party to follow. The Urban Decay Conference 2016 was held in The Arora Suite, which was laid out in a cabaret style, with a front, central stage and large screens. The room was decorated and lit in the brands colours, while circular tables were covered in black glitter with glass bowls of Calla Lilies. During the day, guests were offered a buffet lunch, served at multiple stations. After the conference and awards ceremony, delegates were invited to attend an evening reception where the Arora Suite was transformed into a New York-style nightclub, to tie in with the launch of Urban Decay’s new lipstick collection. Delegates enjoyed canapés, bowl food and prosecco whilst listening to live music. The Sofitel London Heathrow events team assisted with all requests, as well retrieving a stray helium balloon from the roof of the hotel! "Hosting our conference at Sofitel London Heathrow T5 made it the best conference we have held to date," said a spokesperson at L’Oreal. "I couldn’t have asked for more from a venue: the staff were so accommodating and professional, the food was plentiful and delicious, the rooms were great, the space was perfect and the team at Sofitel London Heathrow made it an absolute pleasure to work with. They created a fantastic event that our delegates can’t stop talking about!"